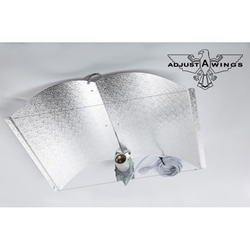 The Adjust-a-wing Avenger is composed of a corrosion resistant, glass coated alloy, which is 98% reflective. 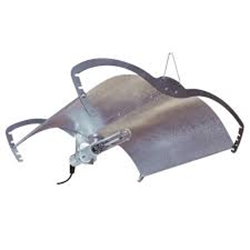 The CFL Pro reflector is a great, cost effective way to start growing. 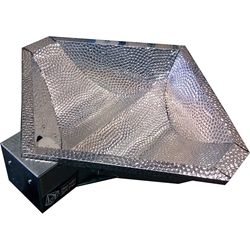 The unique diamond shape of this reflector allows it to focus more light onto the canopy of your plants. The Maxibright Horizon reflector can be used as a standalone unit connecting to your existing CDM ballast or can be purchased as a complete package. Maxibright offer leading hydroponic equipment with excellent build, quality and rigorous testing as standard you can be sure your plants will lap up every last usable lumen regardless of where they are positioned. To get the most out of your lamp and ballast it is essential to use a reflector. As the name suggests, a reflector will reflect the light from your lamp down onto the canopy of your plants. Without one, your lamp will still work but a lot of light will be wasted by being projected away from your plants. We stock a wide variety of reflectors and have one suitable for any type of grow – these include standard euro reflectors, Adjust-a-wing reflectors and air-cooled reflectors. When deciding on which reflector to buy, you should consider the size of your grow room, the amount of heat produced by your lamp(s) and your budget. For small grow areas (up to 1m2) a euro reflector will usually suffice. These are designed to cover a 75cm x 75cm area – but with reflective sheeting they should be sufficient for any area up to 1m2. In such a small space you would not usually use a lighting system over 400 watts due to the amount of heat produced by HPS lamps. 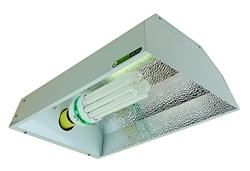 If, however, you want to use a higher wattage lighting system then you will probably need an air-cooled reflector. 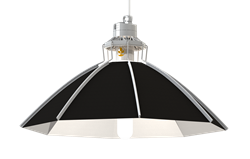 The Prima Klima Cool Shade is designed specifically for small, confined areas. 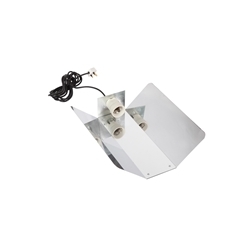 This reflector allows you to extract most of the heat from the source (the lamp) meaning that the temperature in your grow room will be lowered drastically.The only real disadvantage from using this system is that it requires an extraction fan and ducting - making it more expensive. For larger grow areas (1.2m2 and over) there is a larger variety of reflectors available. The Adjust-a-wing reflector is designed to cover a substantially larger area then a euro reflector - each one will cover a 1.2m2 area effectively. These reflectors can also be adjusted to focus the light on a specific area or opened to increase the spread of light. If temperature is a problem in your grow room then you may wish to consider buying an air-cooled reflector such as the Silverstar. 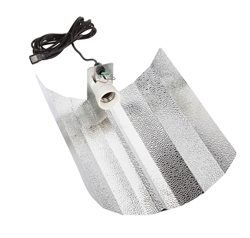 This huge reflector will remove most of the heat from your lamp and remove it outside of your room via an extraction fan. Whilst these reflectors are better suited for larger areas, many growers still prefer to use the standard euro reflector due to its low price. In some cases using these reflectors can be beneficial – due to the fact that you can fit more of them into a larger area. For example, instead of using two Adjust-a-wings in a 1.2m x 2.4m tent, you may wish to use three euro reflectors. 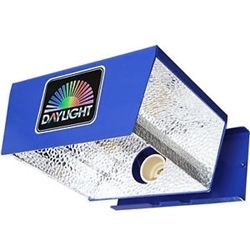 In this case, you will actually be producing more light in your grow room. The disadvantages of doing this is that it will be more expensive (as you will need another ballast and bulb) and more heat will be produced - the issue of heat, however, is usually only a problem during the summer. Whichever reflector you choose to use, you can be sure that you are buying a high-quality piece of equipment. If you have any further queries or questions then do not hesitate to contact us via email, over the phone or in person at our central South West London store.